We say, "This is not the place for us to deal with it." If this is not the place, what is the place? We’ve got to pull our heads up out of the sand. Everybody in this room knows we need to deal with these issues." may 8, 2000. A new buzz word has crept into the American vocabulary: digital divide. A new definition of the haves and the have-nots, which is determined by a person’s access to computers. The unexamined assumption here, to use the phrase of an old philosophy professor, is that computerization equals civilization, and that a successful life is impossible without a hookup to digital technology. The newly emerging global economy is going to transform the world and, in the words of Netcentives CEO West Shell III, "Dot.com is driving the global economy." Maybe. Some assumptions, after the proper test of time, turn out to be just plain silly. But another digital divide is even scarier. The proponents of the digital revolution — or more precisely, the revolution’s entrepreneurs — bring with them a worldview and a language all their own. These traveling salesmen wear the same clothes that garbed the purveyors of oil for the lamps of China eighty years ago. Twenty-first-century Willy Lomans — "way out there in the blue, riding a smile and a shoeshine" — are sporting bright handkerchiefs of moral passion: many of them truly believe that their carpetbags contain nostrums of great efficacy. And if their spiels put a better brand of bread on their own table at the same time, what’s the harm? Somewhere, these landlocked Lochinvars have heard an old adage about rising tides and boats. What feels so good can’t be bad. These hucksters are so locked in the internal logic of their own mindset that they forget the existence of other, less digitalized brains. Many seem to truly believe that they speak the same language as their potential clients. And of course, they don’t. When resistance came in revolutionary China, the poor oil drummers had no idea what hit them. 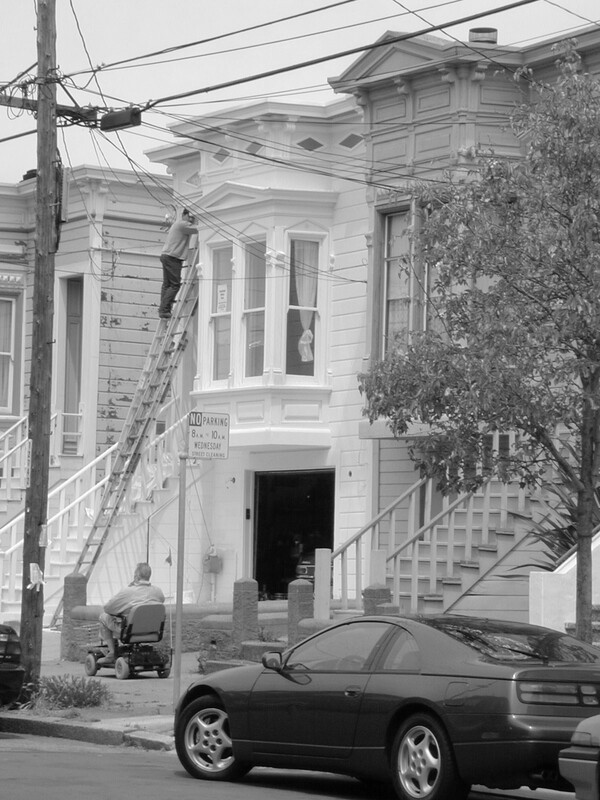 When resistance comes in today’s Mission District, again bafflement reigns. The inspiration for this week’s tirade was a marathon series of civic meetings last Wednesday, beginning with a discussion of housing and homelessness by Our Mayor’s Committee 2000 and ending with a hearing on the proposed development of Bryant Square by the Planning Commission. Throughout the day self-appointed go-getters stood on one side, raring to ride the incoming wave of prosperity onto new beachheads, certain that the surge would slop over onto the beach itself. On the other side stood denizens of the beach, welcoming the possibility of prosperity but fearing that its arrival would signal their departure. The twain ne’er met. At the Planning Commission, for example, lawyer Robert McCarthy outlined SKS Investments’ plans for Bryant Square. The development company envisions a combination of office, retail, and light industrial space in three renovated buildings and two new ones. Located just inside the Industrial Protection Zone, its proposal to occupy some 160,000 square feet and build up five stories is perfectly legal. And its willingness to incorporate amenities — open space for neighborhood use, off-street parking, and below-market-rate space for nonprofits and artists — attempts to dilute neighborhood opposition. "Demonstrate to me," McCarthy challenged, "one project that has gone beyond the code requirements" as this one has. The term "respectful neighbor" surfaced several times. The neighbors obviously didn’t feel respected. They faulted the proposed open space — a courtyard inside the building compound — for its lack of sunlight. They faulted the massive design in a low-rise district, even though SKS had carefully tailored it so that the fourth and fifth stories would not loom over the residential side of the property. 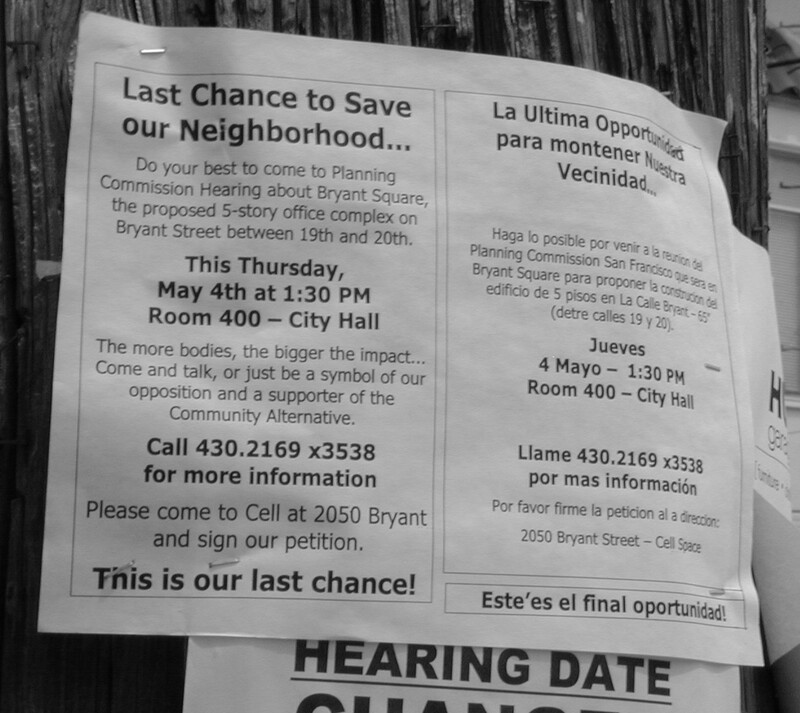 (The opposition continues at the site, where flyers proclaim, "No downtown offices here!) They faulted the plan for displacing the people who occupied the buildings and reducing the space for artists and nonprofits from 60,000 square feet to 6,000. "I’m not sure which community they’re planning to benefit," mused Cell Space’s Jonathan Youtt. Most of all, the neighbors faulted SKS for its failure to include them, the people who live in the residential area just across the street, in the planning process. They knew how hard it was already to find parking. They knew how crowded the buses already were. They knew what resident Peter Sutherland noted, that 197 live/work projects arose last year within seven blocks of the project, including some 150,000 square feet of new office space, and that another 192 projects were in the pipeline. "There goes the neighborhood," many residents must have thought in all seriousness, dreading the transformation of their quiet streets into Multimedia Gulch South. Yes, there it goes, the people at SKS must have crowed, proud of the success of their daring enterprises. According to a quick scan of the San Francisco Business Times, the developer has recently purchased at least eight buildings to convert into multimedia work space. "When [SKS] started on 475 Brannan, they stuck their neck way out, observed Charlie Kuffner, division manager at Swinerton & Walberg Bulders. "Everyone said, ‘You guys are a bunch of looney tunes.’ Now, they’re saying, ‘You’re a bunch of geniuses….’ [and] we’re starting to see Multimedia Gulch move into the Mission." Developers like SKS regard the area as a place to do business, and to do it profitably. For this reason, the company is willing to contribute $1 million to the city’s affordable housing fund and pay its requisite share of transit, childcare, and school fees; it’s also willing to come up with $200,000 to cover displaced tenants’ relocation costs. According to the city’s Ethics Commission, it’s also willing to pay lobbyists to tout its case — more than $50,000 in the first quarter of 2000 alone. And according to the Bay Guardian, it’s also willing to contribute generously to Willie Brown’s political campaigns — $105,000 in soft money and $1,000 in direct contributions last fall, with another $21,000 from the company’s lobbyists to PACs that supported Our Mayor. For the residents of the area, however, it’s a place to live. Small wonder that they resent being relegated to the category of business expenses. Small wonder that the two sides do not speak the same language. The Planning Commission voted 4 – 1 to approve the project. The lone voice in opposition, Commissioner Dennis Antenore, spoke once again of the need to act responsibly in the face of the "economic juggernaut that is rolling through the city, which will hit dead center at this project." The residents plan to appeal to the Board of Supervisors.